"Rumors of the Motorola Droid 3 have been floating around for a while now, and while pictures have been nice, what's been lacking is confirmation on spec details. Now, thanks to a reliable tipster with a history of providing us with confirmed information, we can give you some of that highly desired confirmation." The rumors continue to swirl but it looks like a few more concrete details have emerged about the next iteration of the famed Droid. It looks as if the keyboard has finally been updated to a full five row layout giving us quick access to those oft difficult to find numbers. 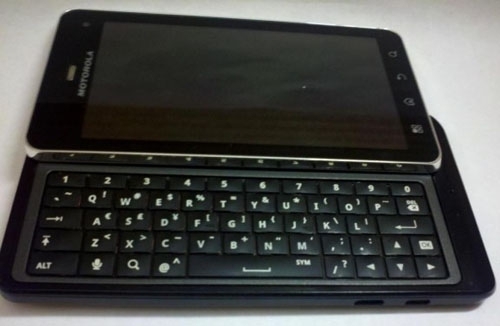 Along with the keyboard the device will be sporting a 4-inch qHD screen, a dual core CPU, and a front facing camera. One thing curiously missing is support for Verizon's fancy new LTE network. Hopefully it just isn't enabled yet via software unlike some Motorola devices *coughXOOMcough*. Either way this device looks to be quite the upgrade over the current Droid 2 LTE or not. Is this the Droid you're looking for?